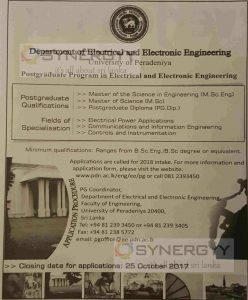 University of Peradeniya , Department of Electrical and Electronic Engineering invites application for the Postgraduate Program in Electrical and Electronic Engineering. Minimum Qualifications: Ranges from B.Sc. Eng./B. Sc degree or equivalent. Applications are called for 2018 intake. For more information and application form, please visit the website: www.pdn.ac.lk/eng/ee/pg or call 081 2393450 to PG Coordinator,Department of Electrical and Electronic Engineering, g Faculty of Engineering, University of Peradeniya.